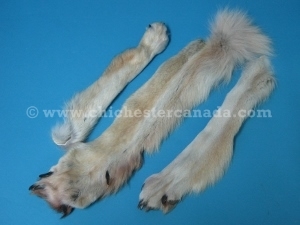 We have real timber wolf leg pieces. Lengths vary, and they may or may not have claws. We measured the longest piece from the above picture (middle) as 56 cm long, 11 cm wide and weighing 0.14 kg. The shortest piece (top) measured 37.5 cm long, 10 cm wide and weighing 0.05 kg.